View this FIP’s FisheryProgress profile here. He leaves his home alone in the middle of the night, often beginning to fish by 2:00am – not for tuna, but for the smaller fish that will bait his hook. Around 4:30am, he searches for birds and dolphins – again, not as quarry, but as guides. The yellowfin he seeks often school with these creatures, providing a beacon to focus his search. When the strike finally comes, the tug of war begins. Man struggles against fish, relying on protective gloves to safeguard his hands against injury by the nylon line, a technique learned and perfected by years of experience, and raw determination. After as much as two hours, the fish tires and the contest is over. Only then can fishers like Pak Hayunan begin the homeward journey – often as much as 50 miles –to unload their catch and prepare to return to the water the next day. The handline yellowfin fishery is a small artisanal fishery, accounting for approximately two percent of Indonesia’s tuna catch in a typical year. But the fish Pak Hayunan and other handline fishermen catch are sold throughout North America. If you’ve bought yellowfin at HyVee, Safeway, Kroger, or Wal-Mart, there’s a good chance you’ve eaten some. Handline tuna fishing is designed for sustainability. The nature of the craft means nearly no bycatch – catching one species while fishing for another – so risks to threatened species like sharks or marine turtles are minimal. The fishing line does not reach the seabed, meaning that this one-man, one-line, one-hook, one-fish handline fishing method has no impact on marine habitat. But demonstrating the sustainability of this fishery was another challenge. When Anova Food’s Fishing & Living Initiative launched its Indonesia handline tuna fishery improvement project (FIP) in 2011, the government did not have enough data to estimate catch volume, let alone the impact on protected species. Anova hired their own staff to collect catch and trip data, seeking out and bringing on applicants with fisheries management training or backgrounds. 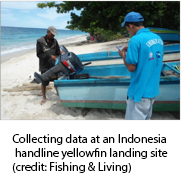 Within a few years, Anova launched an NGO – MDPI, in English, the Fishing and Community Foundation of Indonesia – to coordinate the data collection. The effort started small, collecting data in just one landing site, but has expanded over just four years to cover 25 landing sites across eastern Indonesia. Today, the FIP’s data is of sufficient quality to be considered and to contribute to management decisions. The Indonesian government developed an overarching tuna management strategy in 2016. In 2017, it is expected to release more specific policies that take into account variations in species and fishing gear. A second sustainability challenge identified by the FIP’s initial assessment was illegal fishing. When most seafood industry observers think of Illegal, Unreported, and Unregulated (“IUU”) fishing, the image that comes to mind is a large, mechanized vessel bringing in thousands of fish a day. But, technically, many individual Indonesian fishermen were operating illegally because they had not obtained a license required under Indonesian law. They were unlicensed because, after generations of fishing in the same area, the fishermen were unaware that a license was required, and the Indonesian government lacked the resources to mount an effective awareness-building campaign. For many handline fishermen, awareness alone would not have made a difference. Illiteracy would have prevented fishermen completing the application, an inability to take time away from work would have prevented fishermen submitting the application, and poverty would have prevented fishermen paying the application fee. Again, the Fishing & Living FIP dug in to do the hard work. MDPI staffs not only collected data from local fishermen, they also explained licensing requirements. They brought application forms to fishing villages, collected the required information from local fishermen, paid the filing fee, and brought approved licenses back to the fishermen. After 18 months of sustained effort, the FIP had registered 500 handline yellowfin fishermen, dramatically reducing illegal fishing. In fact, this effort has expanded beyond licensing to encompass transparency. Hundreds of fishermen are now voluntarily sharing sustainability data, including licensure and IUU assessments, through an online platform developed by the International Seafood Sustainability Foundation. While bolstering the sustainability of the handline yellowtail fishery, Anova also works to improve the quality of life for fishermen and their families. 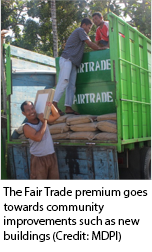 A partnership with Fair Trade USA and MDPI has helped to enlist fishermen in activities like the licensure drive. “It’s been easier to engage them if we can tie the work the FIP is doing to the potential for a higher income,” said Helen Packer, coordinator of Anova’s Fishing and Living™ program. 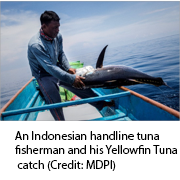 In just a few years, the Indonesia handline yellowfin fishery improvement project secured reliable data where none existed, informed the development of stronger fishery management policy, and made real headway on IUU fishing. The FIP collaborators will seek Marine Stewardship Council certification in 2017, anticipating a decision in late 2018 or early 2019. Whatever the outcome, Anova’s experience with the Indonesian handline tuna FIP shows that a small-scale, data-poor fishery can make meaningful progress towards sustainability on the global scale.